In a study published today in the journal Climatic Change, Drexel University sociologist Robert Brulle shows that between 2000 and 2016, lobbyists spent more than $2 billion trying to influence climate legislation in the U.S. Congress. Analyzing data from lobbying reports made available on the website OpenSecrets.org, Brulle found that electric utilities spent the largest sums during this timeframe followed by the oil, gas, and coal industries, and transportation sector, respectively. Overall, lobbying by corporate sectors involved in the production or use of fossil fuels overshadowed that of environmental organizations and the renewable energy sector by a ratio of approximately 10 to 1. “Different corporations typically push for whatever positions are advantageous to their economic well-being,” writes Brulle. He says that further research is required to parse out the effect of such variable lobbying positions on climate legislation. Though climate lobbying only accounted for 3.9 percent of the total amount spent on legislative lobbying between 2000 to 2016, its rates fluctuated considerably. Early on, relatively little money — only about $50 million, or 2 percent of all lobbying — was spent trying to sway federal legislators’ opinions during the years leading up to and including 2006. 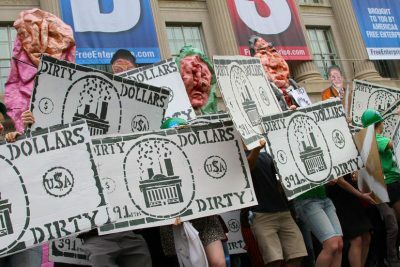 To explain these fluctuations, Brulle argues that climate lobbying grows as the potential to enact climate legislation increases.This is especially true when one party, that has campaigned on passing climate legislation, controls government – findings that have troubling implications for American democracy. According to Brulle, that this has important implications for the fate, outcome, and nature of future climate legislation, which is largely determined by intra-sector and inter-industry competition. He says that the activities of environmental and nonprofit organizations often constitute one-time, short-term mobilization efforts. This is a clear disadvantage, given the vast expenditures and continuous and established presence of professional lobbyists in D.C.
Brulle told DeSmog his findings partially explain the lack of forceful action on the climate crisis in the U.S.